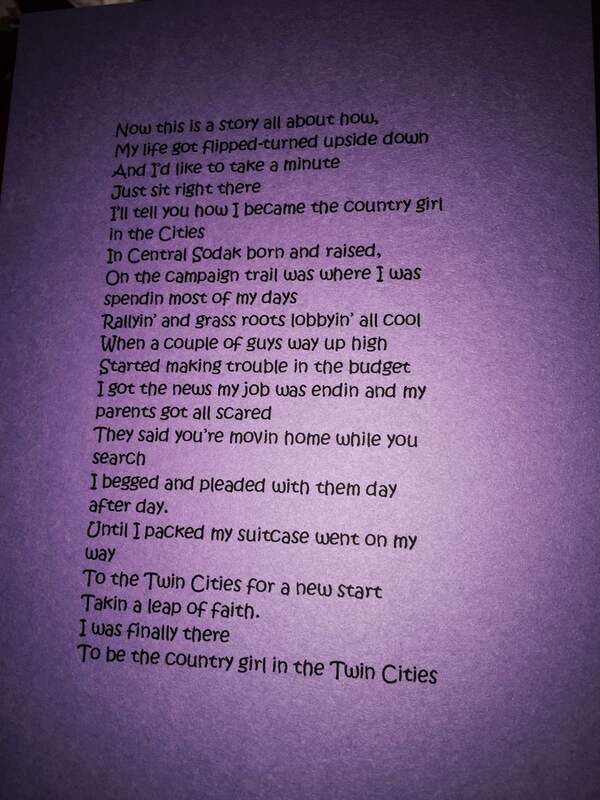 My favorite print ever is from a Minnesota photographer and has a beautiful country scene with a lyric from Brad Paisley’s Find Yourself printed on it. These lyrics hit me when I first saw the photo and every time after that. Music is one way I purposefully lose myself when I need to find myself. I’m one of those people that uses music to speak the words I can’t. I also tend to love to let myself get lost in shows and books. Not simply as an escape from reality, but I find characteristics I love in characters and latch on to what I see of myself or what I want to be. When I’m struggling to define something in my life I look for lyrics, shows, or book to put my feelings and thoughts into words. What have you done lately to get lost so you can find yourself? I’m working on reading and writing more this year. And just truly letting life lead me on whatever may come next in this crazy journey of mine. Last week while getting my eyebrows waxed at the Walmart Smart Style salon (don’t judge…they do a good job and you can walk in. And closer than the nearest Cost Cutters to my house.) I had the most amazing conversation with the stylist. I’m constantly dealing with family, friends and people that know nothing about me asking when I’m going to settle down and have kids. Instead upon asking what I did and finding out that my focus has been on my career and self happiness this awesome lady, Mary built me up. She applauded me for not worrying about the societal expectations and putting myself first. If only more women could do this of other women. And even myself I need to be better about this. We are all different. We all have different life plans. We all have different journeys. We all have different desires. Just because I’m not ready to settle down and be a mom doesn’t mean I don’t love & support my family and friends that have at my age or younger. That’s their choice and I’m truly happy for them and I love spending time with my friends/family that have started their own families. These societal expectations aren’t going to disappear over night. These judgments won’t just be erased magically. But we can all do better. And while these judgments and expectations aren’t limited to only being from women, we should start to life other women up together first. Maybe the men of the world will see and follow our movement. Maybe they won’t. You don’t have to love or even like another woman to believe in them deserving to be appreciated and complimented for being just who they are. You have a choice with every person you encounter to lift them up, push them down, or act like they’re invisible. Why don’t we all try to do more lifting up? That’s a goal this year. Lift up those around me. Whether I know them or not. And if I see others pushing people down I strive to stand up for them. Because we all have so many struggles that are invisible to the outside so it is time we realize that we can never truly grasp the struggles the next person is facing or know what might be the final straw in their struggle. 2016. It is hard to believe the first full week of the new year is already over. 2016 felt like years away when I originally planned that I wanted to go to Nashville to celebrate my 30th birthday. Yes, 2016 is the year that I turn 30. I used to half dread that number, but really 26-29 are weird years. Not quite feeling like a full blown adult, still many transitions, just in between weird years for me. There are days that it still feels like yesterday that I was finishing my last semester of graduate school and moving to Sioux Falls. Really May will be 6 years ago that I graduated with my Master of Arts degree in Communication Studies and made the move to Sioux Falls. That move was so important for my life in so many ways. And yet Sioux Falls wasn’t where I was meant to stay. But those 4 years shaped my life significantly and led me to the path I am on today. I started 2015 so excited about where I was working and what life had going for me. But 2015, proved to be a roller coaster of a year. Keeping it simple, I soon realized that the job wasn’t what I wanted to be doing or where I wanted to be doing it. And while it was scary to be laid off in August it was such a blessing. In fact, I’d already submitted for the job I was offered just a few weeks later because I knew I needed something more. 2015 brought an amazing opportunity that took a leap of faith. Contract employment is a scary thought when all you want is job security, but the opportunities and growth I’ve experienced thus far on this contract and the work that I’m doing makes the fear worth it. There are days that I miss writing social content 24/7, but social governance truly lights a fire in my eyes in the weirdest way possible. 2015 also brought a move to suburban life. Living in a townhome where my 4 legged family members can visit and I can truly feel like I have a home. I love the feeling of a home and knowing I’ll be here until August 2017 without the commitment of buying yet. But enough about 2015. This is supposed to be about 2016. 2016….the year I turn 30. The year I do at least 30 random acts of kindness. The year I travel more. The year I take more photographs. The year I take control of my fitness life again. The year that I read at least 52 books. The year that I blog at least 52 times. The year I make a new blog potentially. The year I start writing for fun again and possibly finally start that chick lit/loose fiction novel I’ve always dreamed of writing. 2016 is the year that I take more time for myself. 2016 is the year that I’ll go to an Oklahoma Football game, Boomer Sooner! 2016 is going to be a great year. I can feel it. What will 2016, bring for you? You are the only one that can truly define your life, your year. Obstacles will happen, but how you overcome those obstacles is how you make it your year. Find reasons to smile and laugh every single day. Be happy. Remember that I’m the only one that can define happy. Sometimes change is expected. Sometimes it is welcomed. Sometimes it is unexpected. Sometimes it is not welcomed. I have always struggled with making the decision to change my life. Maybe that’s why it is in some higher up’s plan to make those changes happen for me. And not on my terms. My position was eliminated last week for realignment of budget. I wasn’t expecting it at all. I’m obviously not thrilled about being back to job searching full time. But I’m making the best of the situation. I’m really looking at what I want out of my life, my career and so on. Public service type jobs have always been my true calling. I thought after the last budget cut I needed to escape them, for better stability, but maybe I don’t. Truly I don’t know what’s next. I’m open to exploring all of the opportunities and I’m learning what I don’t want. I’m seeing what is out there and going with the flow. I’m growing. And I know at the end of this obstacle, I’ll learn yet again that there was a blessing in disguise and a lesson in this challenge. That doesn’t mean the challenge is welcomed or rejoiced. But I’ve learned that it is best to find the positive in every obstacle brought my way. And goodness gracious I’ve had my share of obstacles. I like to think that I get all these obstacles because God or some higher being knows that I can handle them with grace and dignity and come out stronger. Well I won’t technically be going blonder yet, but I think I’ll get stronger and when I have news to celebrate perhaps I’ll celebrate by going blonder! With the upcoming move I’ve been on a Pinterest binge trying to determine how to best organize my room and the office space. And I’ve decided two things…I want to make a “captain’s bed frame” for myself and I want to do a DIY desk. This photo comes from Stop Staring and Start Sewing, blog by Jona Giammalva – It links back to their blog post about creating this bed which is the same blog post I link to when discussing bed plans. I’m really nervous about taking on this project by myself. But am hoping some of my friends, especially guy friends that are better with a saw or at least more experienced with a saw will help me. First of course I have to make sure I could fit an upgrade to a queen size bed in my new room which is much smaller than my current room. If I’m not upgrading to a queen size I don’t know that I’ll do a new bed frame. This desk plan & photo is from Lindsay Stephenson’s blog. I don’t know if I’ll do 3 pieces of wood like they did or try to find something a little easier to do, but I like the idea of storage to hold it up and like the idea of two spaces one for the laptop/plain crafting or even a desktop and the other space could be for a sewing machine once I get my own. I have tons of other DIY ideas to utilize within my new spaces that I’ll have to make the most of them. I cannot wait until the move so I can start with these bigger projects! Until then I’m continuing to weigh different plan options and look into other storage ways that I can incorporate into my bedroom and the office space. One thing I’m really looking to figure out is boot storage. I have the boot holders from Container store where 4 pairs fit on it upside down, but with 6 pairs of cowboy boots along with my riding, winter, snow and rain boots I want something prettier for my cowboy boots at least. And yes I do have a boot problem, I know. I’ve had plans for another tattoo pretty much since the day I finally got my first one almost 4 years ago. I still want that tattoo that I thought would be my 2nd, but I actually have decided to get a different one first. Two songs spoke to my heart strongly when I was playing with the idea of leaving Sodak. The songs spoke even stronger when the decision to leave was forced on me through a blessing in disguise, budget cuts at my former employer. I took on the meaning of both songs to heart for they spoke what I couldn’t always explain to my friends and family during a trying obstacle. In fact I actually remmber listening to “Follow Your Arrow” the day I found out about my position being cut to PT. I already had MN in my eyes for my new home before that news came. 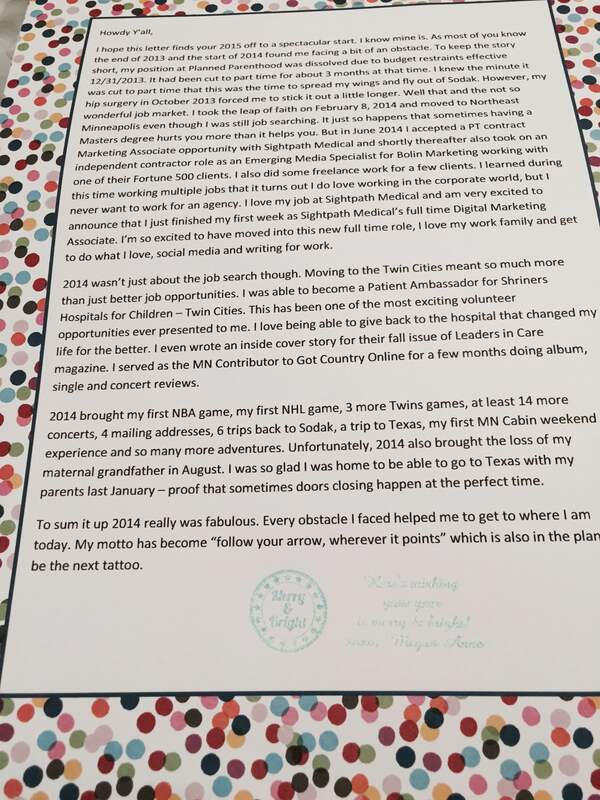 But I didn’t have a timeline or plan to leave my position in place…I just knew MN was in my future at some point. Well with partial then complete closing of my door at PP I chose to take “Follow Your Arrow” on as my new mantra and did just that as I took a leap of faith and moved to Minnesota. And now it is time to make that mantra a part of me, just like the name of this blog is a part of me. Not everyone chooses to ink their life mantras to themselves, but for me it is part of me to the point it needs to be part of my canvas. The exact design is still in the works and I may even just go spur of the moment with it. But the meaning it holds for me was secured many months ago. I can’t wait to show off this latest addition to the canvas of my life, my body soon. Hopefully very soon. I’ve been wanting it for a while, but life and budget had pushed it back. However I’ve managed to fit it into my budget by cutting back on my summer concert schedule. A decision that wasn’t easy to make if you know me. I don’t love this font or this layout, but the arrow design I do dig. 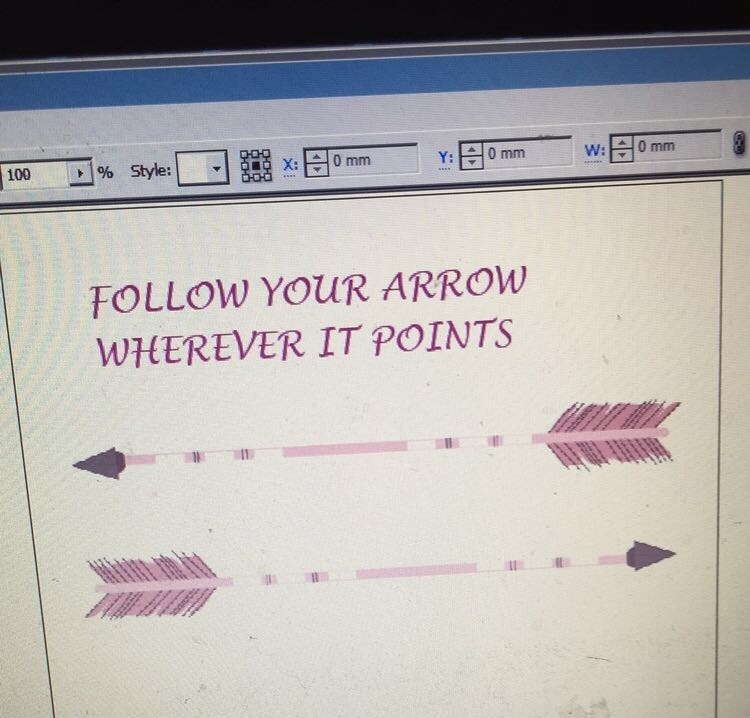 I’m thinking diagonal arrows. Still back and forth on color or black & white since I do tend to have a nice summer tan and color fades faster. Have no fear, I’ll be sharing the final once I have it done! 30 by 30…the countdown is on! My 30th birthday is 281 days away. Meaning that my 30 by 30 list is on a countdown. However, I may give myself until the end of my 30th year in hopes of getting a few more items on this list done. I probably won’t get them all done, but I do want to make another push to try some of these new activities I’ve always wanted to do! Learn how to cook more options and become a better baker. Promote more research into genetic causes behind bilateral talipes equinovarus. So who wants to take on one of these items with me? I think most of my New Years letters have now hit mailboxes and thus I’m finally officially announcing some news. Many have figured it out already since I updated my employment status on LinkedIn and Facebook, but I am now the Digital Marketing Associate for Sightpath Medical in a full time role. I moved into this role on January 19th and the last two weeks have been beyond awesome. I absolutely love working at Sightpath and was waiting and hoping for this opportunity to move from a part time contract role to a full time role. Now for those of you that weren’t on my mailing list, I still wanted to share the full extent of what I sent out! And last, but certainly not least being the music person that I am and wanting to have some fun I decided to take my country girl spin on the Fresh Prince theme song! My take on the Fresh Prince theme song! It’s that time of year, well a few days late at that, but it is New Year’s Resolutions time. I know many people against making resolutions, some for making them and others who just don’t care. I used to be in the latter. But a few years ago I started making and achieving a portion of them and realizing that writing a post allowed me to be held accountable and motivated. I still won’t say that I’ll achieve all of them. In fact I prefer to say these are things I want to strive for then achieve because life is a constant journey so 1 year isn’t always the end date on these goals/resolutions. These are ways I can strive to be a better me and live life up. I’ve been Diet Coke free for almost three years and fast food free (except Subway) for over 2 years, but the gym thing hasn’t stuck. Of course my hip injury, surgery and losing ground on my rehab all play into that, but enough excuses. My 1st resolution that I’m striving for is to rebuild my hip strength and find an exercise schedule that I can stick to without overdoing it, but while continuing to improve my hip strength and endurance. This won’t be starting at a gym. Time to start back with my rehab exercises and ankle weights for a few weeks before I attempt the gym. Blog more. Write more. I say this every year and every year it comes and goes in spurts. This year I want to be consistent. I’ll never be a post every single day person, but with my hashtag a day book I’ll have content that I can do a year end recap on if I ever desire. However I do strive to post at least monthly to my blogs. And to try to do some other writing as well. Read more. I LOVE reading. You know those nerdy kids that hid flashlights & books under their pillows to read after bedtime? Yep, that was me! And that was after they took away my reading light for a while because I’d stay up all night reading. I can’t tell you how many times I’d get in trouble in class when we were taking turns reading because I didn’t know where we were because instead of paying attention I had been reading ahead. And the list of books I’ve finished in one sitting is quite long. All that said the last year I can hardly remember reading. I’m not sure why, but that’s going to change. Be kinder to others and myself. I’m often my biggest enemy. I want to strive to be kinder, nicer, and there for people around me regardless of if I know them or not. I strive to be more willing to forgive myself. Willing to believe in myself. Willing to be fine with myself just the way I am. Get out more. For fun. For networking. For whatever. Just get out more. Help others (MOTHER) realize that all that matters is happiness. I love my life. Now if only my family and friends could quit caring when I’m going to get married and have kids and just be happy, I’m happy. Would I like to find a partner in crime eventually? Yes! But I’m not stressing about when it will happen. I get to do what I want, when I want, so why would I stress? Do I get bored sometimes? Yes. But am I lonely? Hell no. If I can’t make her realize this, then this turns into learning to tune anyone that feels the need to ask why I’m single or comment on it out automatically. Do a RAOK at least once a month. Always participate in paying it forward. Say thank you more, for the little things. Show constant appreciation. Love loudly. Be that my coffee, a song, boots, dogs, my family & friends or should I find a partner in crime. Show my love for everything I love, loudly. Remember to tell those that mean the most to me; that they do. Life is far too short to worry someone doesn’t know how you feel. Live my life to the fullest. Take every opportunity I can. Take chances. Take leaps of faith. Live life out loud. Stop sitting on the sidelines. Listen to music more. Step outside of my boundaries some. Embrace my favorites. Listen to it at home, at the gym, in the car, at work and especially listen to it live. Music has always been one of my true loves…I need to remember to turn to it more. Strive to become more organized organized and less chaos organized. This is a lifelong battle of mine when it comes to my mind, my email, my to do list and especially my bedroom. Attempt to try new foods and healthier foods. I’m always going to be picky, but at least trying new things is important. Continue to grow my volunteer experience and find ways to give back to the causes and organizations that mean the most to me, that have shaped me into the person I am, and find ways to do so while utilizing and growing my own talents. More me time. Hot baths. Reading. Writing. Working out. Crafting. More time to enjoy myself and let the stress of life go. But most of all remember that simply because I don’t fulfill a resolution or goal that it doesn’t define me. I can define myself and failures and obstacles only make me stronger as long as I allow myself to learn from them. I rang 2014 in with some of my favorite people. My MN crew which has become my MN fam. I couldn’t have picked a better group of people to ring in 2014 and ring it out. 2 amazing roommates (not at the same time) well technically 3 if you count that I didn’t move out of Bets until Jan 4th or so. Too many laughs, fun nights, and memories to count. 2014 might not have looked exactly like I imagined, but it was still damn good. Now here’s to 2015 being even better. I have two very strong reasons why it will be that will be announced in the coming weeks!